Rich, well-drained, lowland forest openings. Shade intolerant. Early May to early June. 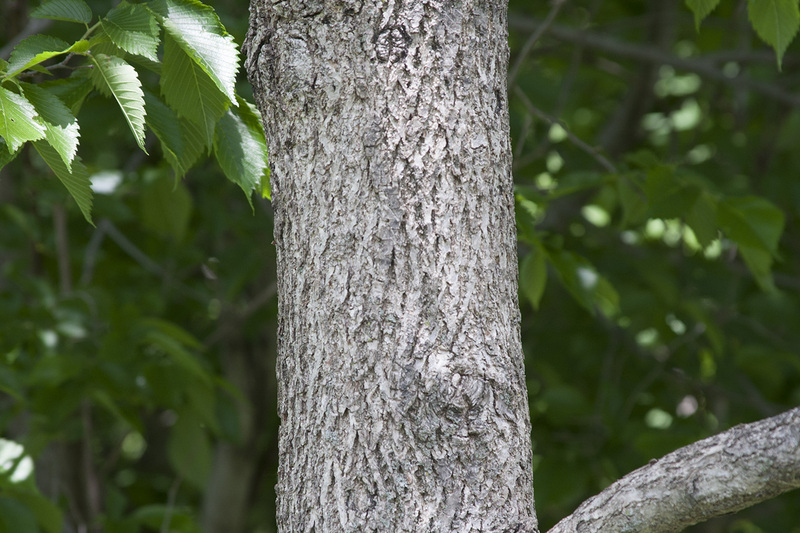 This is a medium-sized, fast-growing, deciduous tree rising on a single trunk. It has a deep, wide-spreading root system and a deep taproot when young. It can be up to 130′ tall and 96″ in diameter in breast height, though in Minnesota mature trees are usually 50′ to 70′ tall and 24″ to 36″ in diameter. It is moderately long-lived, surviving up to 150 years. The trunk is thick, straight. 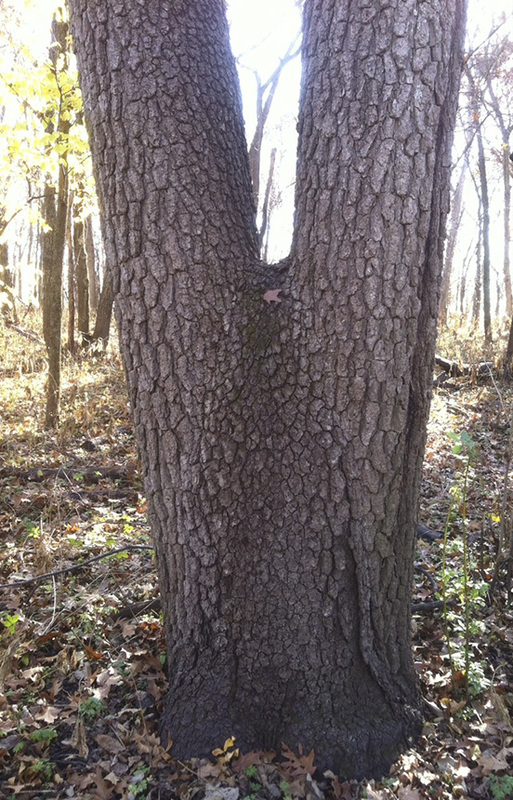 The lower trunk is free of branches, and the middle and upper trunk develop a few large, ascending branches. In open areas it has an open, rounded crown up to 70′ in diameter. Under competition it is taller and has a small, open crown. 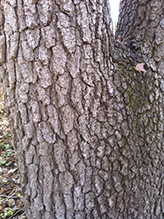 The bark on young trees is thin, light brown or light grayish-brown, and scaly. As it matures it becomes moderately thick and divided into ridges and narrow furrows. The ridges are flat-topped, intersect every 12″ or less, and are broken horizontally at irregular intervals. The ridges and furrows form a rough diamond (◊) pattern. 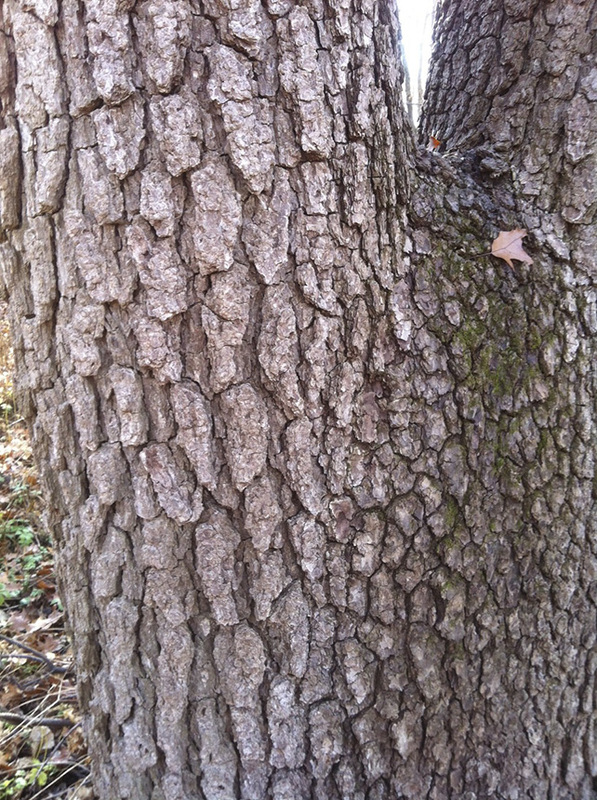 On mature trees the bark is thick dark brown to grayish-black, and deeply furrowed. The furrows are intersecting and broken horizontally, forming upright and inverted Y and V shapes. 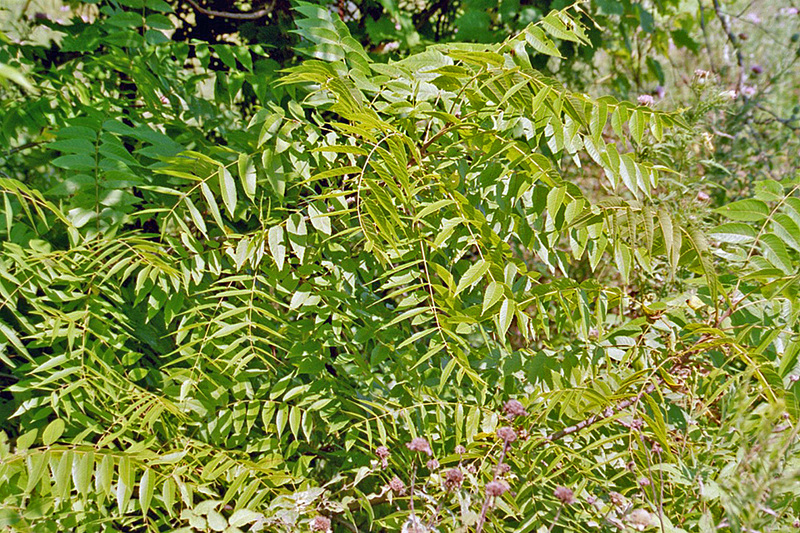 First-year twigs are stout, round in cross section, greenish-brown, and densely covered with both glandular and non-glandular hairs. 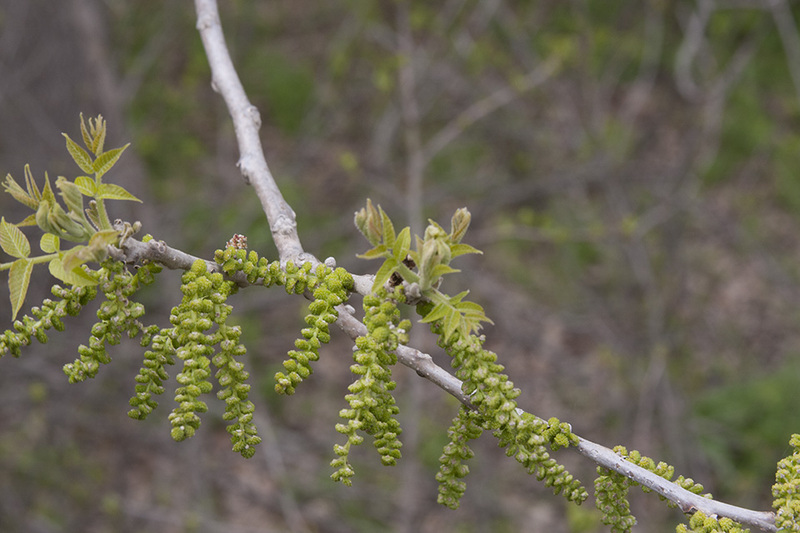 Second-year twigs are brown or grayish-brown. They are sparsely covered with glandular and non-glandular hairs or are almost hairless. They have scattered, small, slightly raised, pale, corky dots (lenticels). There are no thorns. The pith is buff and appears as thin walls with hollow chambers, looking something like a honeycomb. 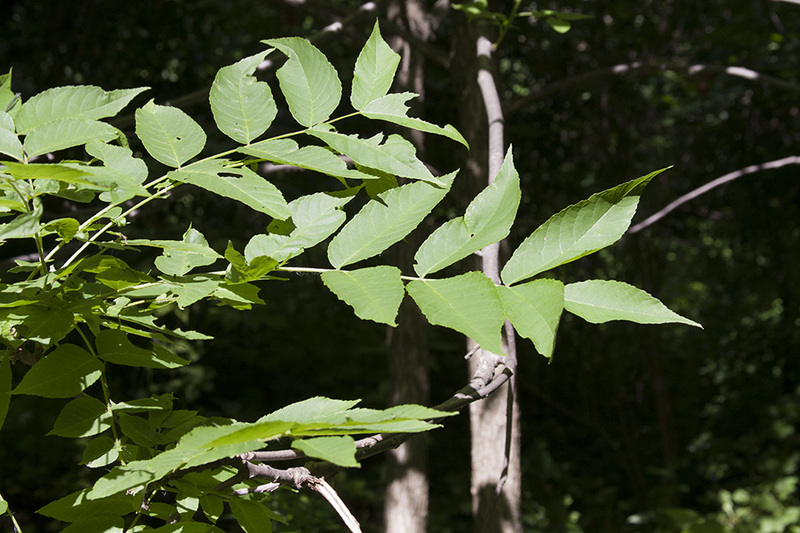 The leaf scars are broad, conspicuous, raised, and inversely heart-shaped. The upper margin is deeply notched and does not have a ridge of hairs. There are three large, U-shaped clusters of bundle scars. The appearance has been described as three horseshoes or a monkey face. Terminal buds are egg-shaped to almost globe-shaped, 5 ⁄16″ to ⅜″ long, slightly flattened, and blunt at the tip. They are covered with a few tan to white, hairy scales. Lateral buds are much smaller. 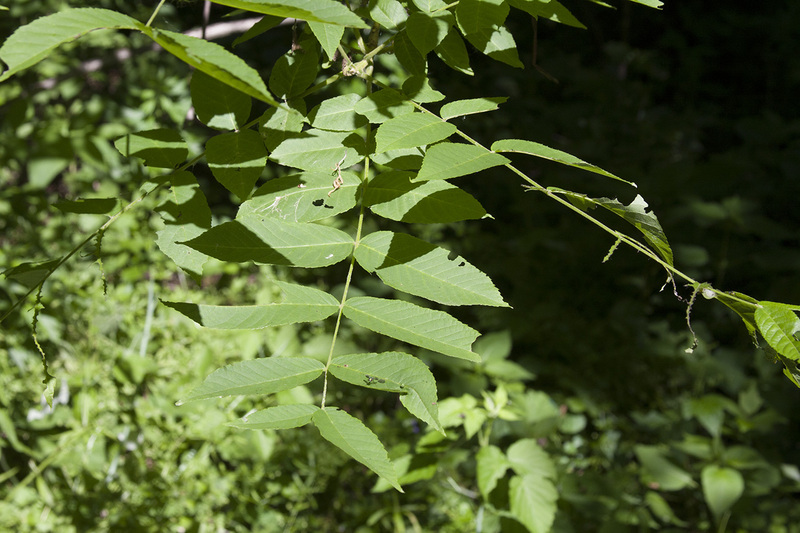 The leaves are deciduous, alternate, and 8″ to 24″ long. They are pinnately divided into 14 to 23, usually 15 to 19, leaflets. 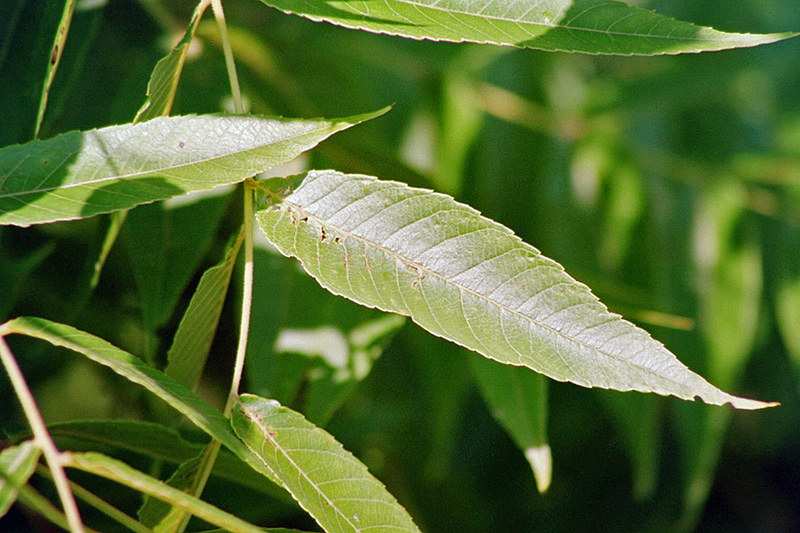 They are on 13 ⁄16″ to 3½″ long, hairy leaf stalks. The leaflets are nearly stalkless, egg-shaped to egg lance-shaped, 2¾″ to 5½″ long, and 1¼″ to 2¼″ wide. 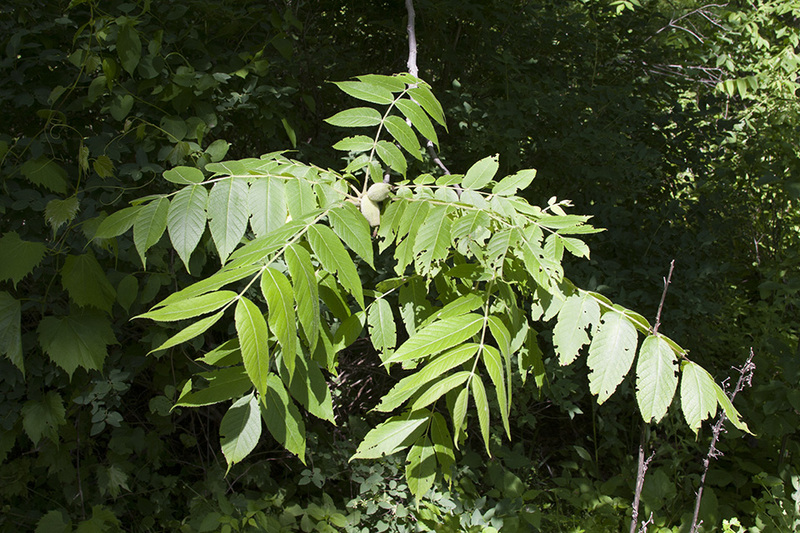 They droop downward from the main axis (rachis) of the compound leaf. They taper to a point at the tip with concave sides along the tip and are rounded or nearly squared and asymmetrical at the base. The upper surface is dark yellowish-green and hairless or sometimes has scattered, head-like bundles of minute, gland-tipped hairs along the midrib. The lower surface is pale green and hairy along the midrib and in the axils of the lateral veins. The hairs on the lower surface are bundled but not branched. The terminal leaflet is missing or, if present, much smaller than the lateral leaflets. The margins are finely toothed with sharp, forward pointing teeth. The leaflets are strongly aromatic when crushed. In autumn the leaves turn yellow. Male and female flowers are borne on the same branchlet. They appear early May to early June. 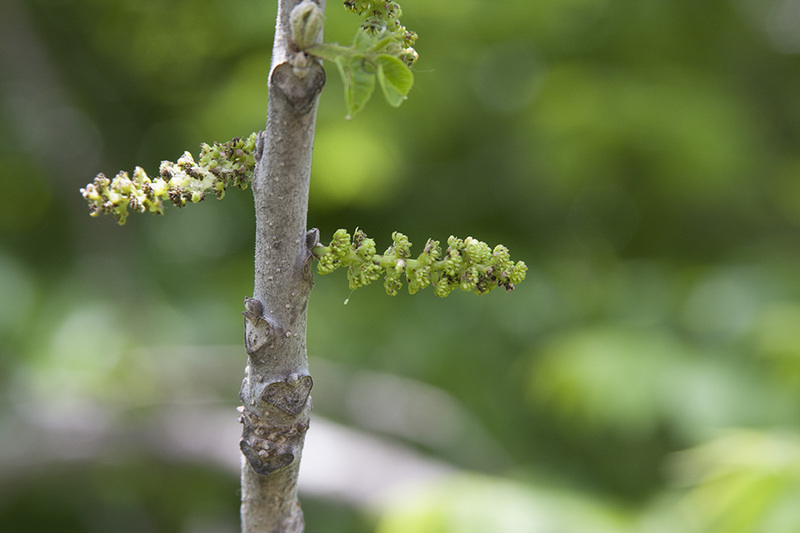 The male inflorescence is a slender, 1½″ to 4″ long catkin drooping from the base of previous-year twigs. 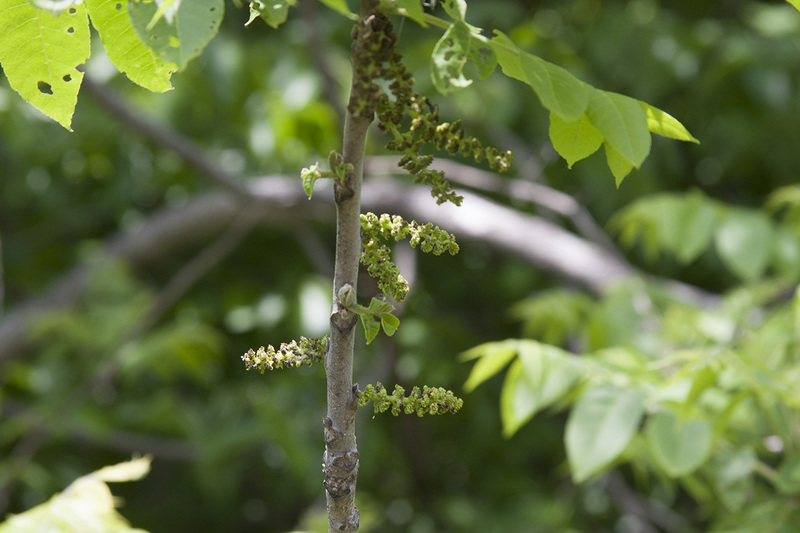 The female inflorescence is a cluster of 1 to 4 flowers on a short spike at the tip of current-year twigs. The flowers are pollinated by wind. The fruit is a nut enclosed in a husk appearing singly or in clusters of 2 or 3. The husk is greenish-bronze, thick, more or less globe-shaped, and 1¾″ to 2¾″ in diameter. It is slightly hairy but not sticky and not covered with glandular hairs. It ripens in late August to late September and is dispersed by animals. The shell of the nut has rounded ridges. The seed is sweet-tasting. 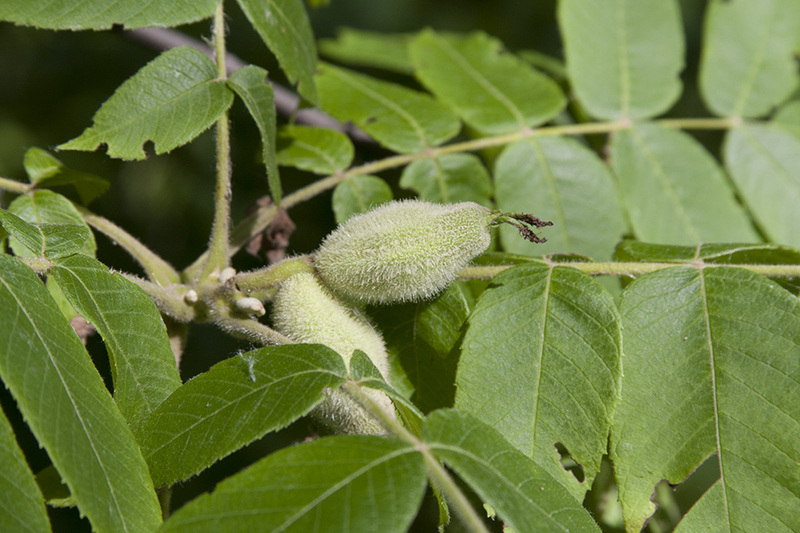 Butternut (Juglans cinerea) has dark brown pith in the twigs. Terminal buds longer, up to ⅝″ long. The leaf scar has a band of hairs above it. 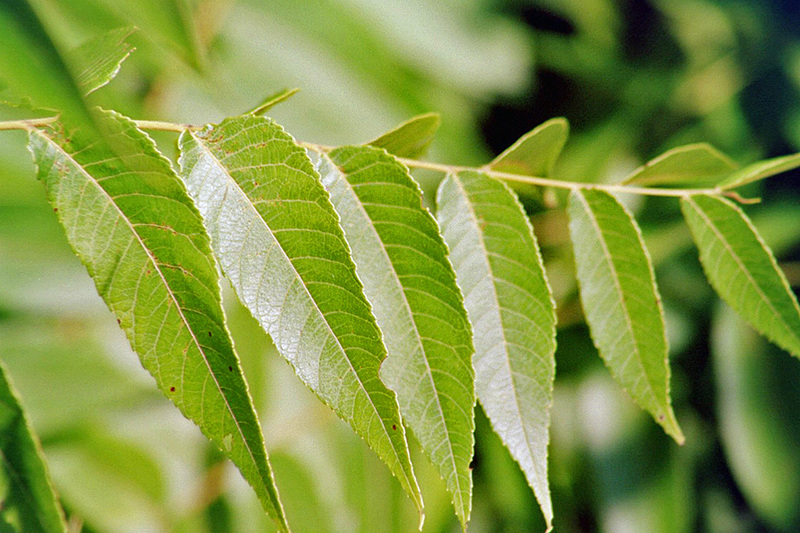 The leaves are divided into no more than 17 leaflets. 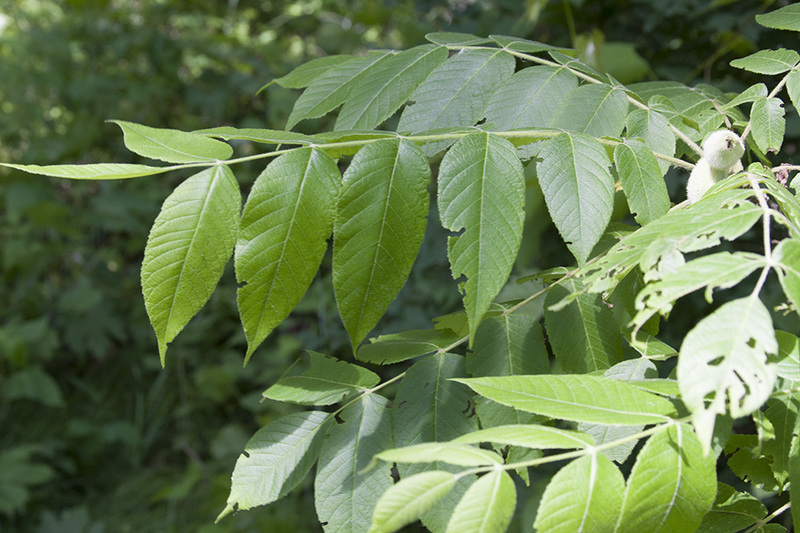 The leaflets are flat, they do not droop downward from the central axis (rachis) of the leaf. The terminal leaflet is present and well developed. The upper side of the leaflet is sparsely to moderately and evenly hairy. The underside is often densely covered with branched hairs. The husk of the fruit is distinctly longer than wide and somewhat pointed, not spherical, and is with glandular hairs making it sticky to the touch. The shell of the nut has irregular, jagged ridges. 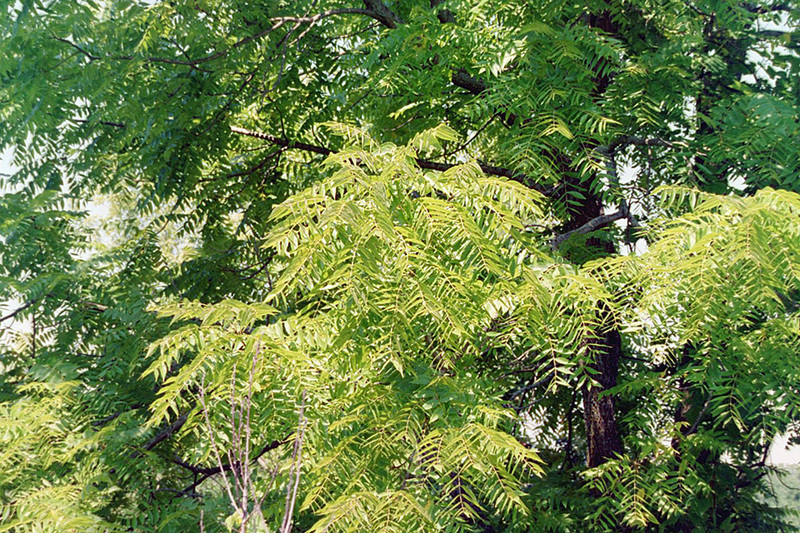 The champion black walnut in Minnesota is on private property in Oronoco, in or near Olmsted County. In 1981 it was measured at 91′ tall and 205″ in circumference (65″ in diameter). 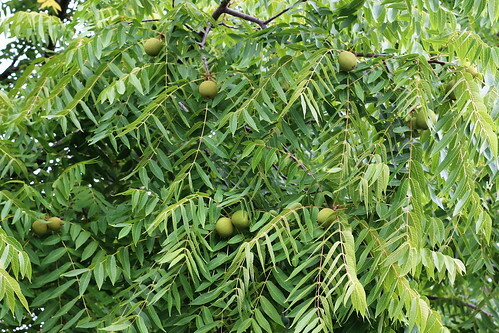 How do you identify the black walnut tree? Well watch the video to findout. 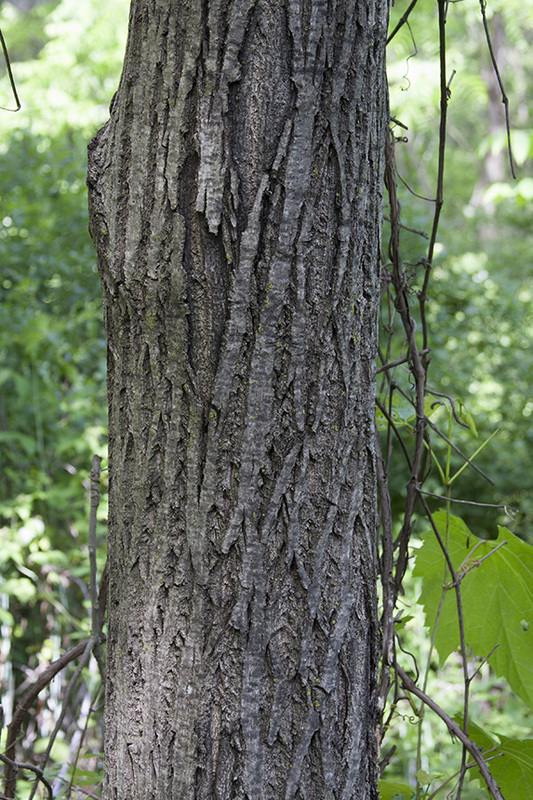 In this chapter of Trees, Pests & People, we look at the threat of thousand cankers disease as it looms from a distance over the Missouri black walnuts. 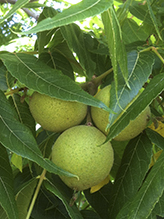 Trees, Pests & People is the story of three kinds of trees -- Walnut, Avocado and Ash. These trees are united by the threat of invasive insects and diseases -- forest pests from other countries that are killing trees across the nation. But more than the trees, this is the story of how these threats affect everyday lives, and how we can all fight the problem of invasive pests. This video was made by The Nature Conservancy with funding from USDA-APHIS. For more information on these pests, and what you can do to help, visit www.dontmovefirewood.org.